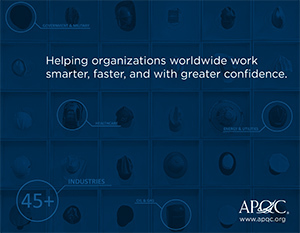 More than 550 organizations from 45 industries worldwide come to APQC for one reason: to improve. When an organization becomes an APQC member, every employee gains access to benchmarking assessments, data, best practices, business expertise, and a network of peers who understand the tremendous impact sustainable process management capabilities have on the bottom line. All included in the cost of membership. Access the findings of more than 8,500 benchmarking and best practices studies in the online Knowledge Base. The Knowledge Base contains content items based on validated data and primary research to help you make innovative and well-informed business decisions. Our benchmarks, best practices, case studies, white papers, tools, and templates cover core business issues in process management, financial management, knowledge management, and supply chain management. Measure and compare your performance internally and with that of peer organizations using robust online tools. Our benchmarking tools are designed to help you diagnose problems of any size—and understand the next steps to solve them. Receive targeted benchmarks instantly or perform deep-dive analyses of multiple processes and activities. Measure, Manage, and Learn. Your Organization's Processes in Context. MosaiQTM is a cloud-based solution designed to simplify business process management for organizations of all sizes. It enables you to measure, manage, and learn about your organization’s business processes and can help eliminate any frustration faced during the adoption and long-term use of APQC’s Process Classification Framework®. Using MosaiQ, you can quickly create custom frameworks that scale and mature as your business evolves and access your own custom content, as well as benchmarks, metrics, and best practices using APQC’s robust Knowledge Base. Create a common language in your organization to move past defining what the business does–and into how the work is done–with higher order solutions such as content management, benchmarking, and sophisticated collaborative process management activities. Join a worldwide network of more than 60,000 professionals dedicated to process and performance improvement. We connect active members worldwide through virtual and in-person events. Members can also connect with fellow members in the Peer-to-Peer database. And a dedicated APQC relationship manager provides member organizations with one-on-one support to maximum the value of their membership helping them stay informed about new research and upcoming events, and connecting them directly to other members and solutions. APQC membership is organizational, not individual, and pricing for memberships varies by organization type and the membership(s) desired. Please contact us by calling 1-800-776-9676 (+1-713-681-4020 outside the US); sending an email to membership@apqc.org; or completing this form. An APQC relationship manager focused on your industry will provide you with membership and pricing information. Don't forget to ask about our special multi-year pricing for new memberships and renewals. Attend a membership webinar or contact us to learn more about APQC membership.